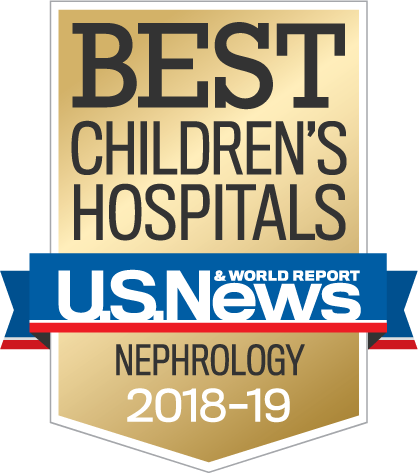 Children's Hospital Los Angeles is ranked among the top hospitals in the nation for nephrology care on the U.S. News & World Report Best Children's Hospitals List. For nearly four decades, our Division has been a pioneer in providing expert, specialized care for children suffering from advanced kidney diseases. Our expert staff treat children with a wide range of kidney disorders, including acute renal failure, end stage renal disease, hypertension, nephrotic syndrome, urinary tract infection, and other acquired diseases and injuries from infancy through adolescence. Our Division is pioneering new tools, treatments and lifestyle-changing clinical programs. We are at the forefront of regional, national and international efforts to bring about healthier lives for children. Our physicians see patients with a wide range of general nephrologic problems referred by community physicians. We make every effort to see patients quickly (within 24-48 hours) when needed. In 1967, we became one of the first groups in the nation to provide comprehensive dialysis services. At any given time, we care for approximately 65 patients who are undergoing chronic dialysis. Vast improvements in dialysis technology and clinical expertise enable even the smallest of children, including newborns, to receive safe, effective dialysis. We use peritoneal dialysis to treat young, small patients since families can be trained to do this at home. In conjunction with the Division of Urology , we care for patients who receive kidney transplants. The source of the transplant is either living related donor (usually a parent) or a cadaveric donor. This Kidney Transplant Program at Children's Hospital Los Angeles is extremely successful, achieving patient and graft survival statistics that rival the finest programs in the United States. Read patient success stories in the Imagine Magazine Spring 2008 issue.